This lovely ballgown on the left is today’s dressgasm but it’s not the whole dress, so I thought I would use today to talk about interchangeable dresses. This piece came from another eBay auction over a year ago from one of my favorite sellers but I don’t know a lot about the history of it, where it came from or who wore it originally. 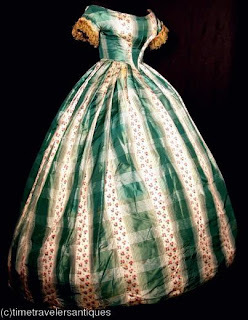 I date the dress to about 1863 based on the pointed waist at a higher level than the natural waist, the dropped shoulder seams and the shape of the skirt. 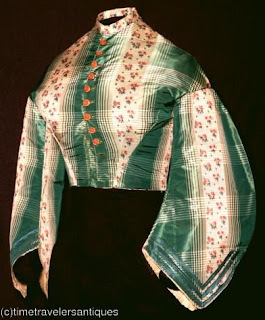 The fabric is most likely some type of silk with alternating stripes of green and white plaid and little red roses. Gold fringe borders the sleeves and their short length tells me that this is a ballgown, although there is very little trim and decoration. 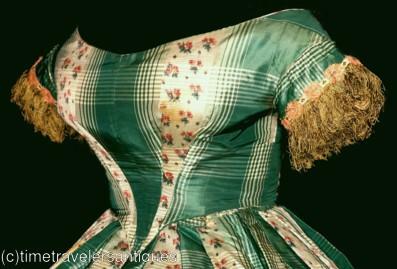 The lady was probably of either simple taste or she put trim on her dress that was removable like fresh or false flowers. People were frugal in the Victorian period even if they were wealthy. This fabric would have been pretty expensive even if it was made of cheaper fibers because of the intricate and large design. The larger the design, the more fabric had to be bought because it would take more to get the seams to match up. A woman would naturally want to show off her pretty fabric but limiting it to the occasional ball wouldn’t get full use out of it. Interchangeable bodices became popular. With an extra two or three yards, the woman could have a daytime bodice made that would allow her to make the most of her clothes. It was like getting two dresses for the price of one.